Republican Gov. 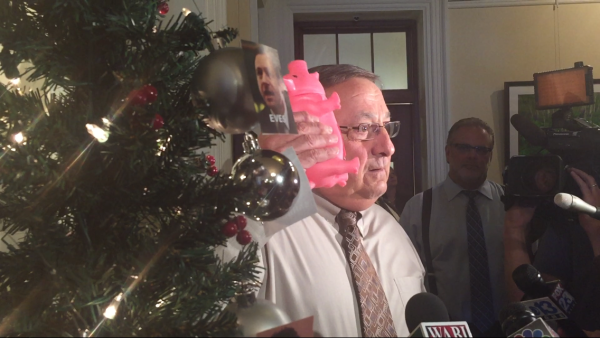 Paul LePage’s latest overture against the Legislature, which he said has passed a biennial state budget filled with wasteful spending and misplaced priorities, included a Christmas tree and rubber pigs. Gov. Paul LePage wields a pig, which he used as a prop on Wednesday at the State House during his protest against the biennial state budget. Gov. 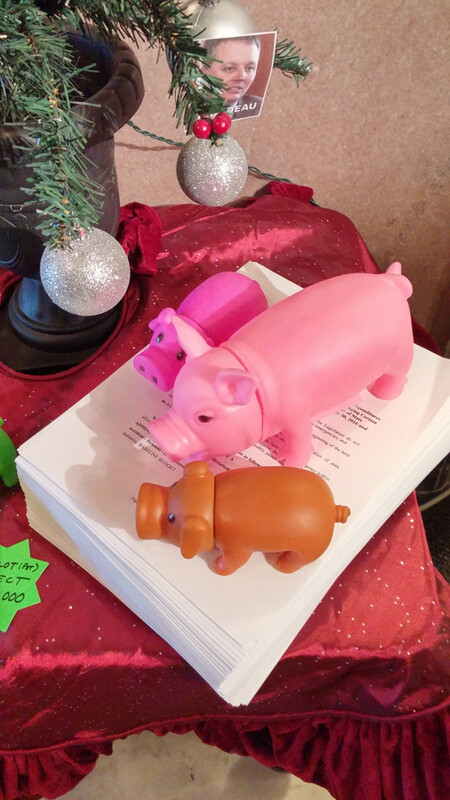 Paul LePage placed a paper copy of the biennial state budget beneath rubber pigs and a Christmas tree on Wednesday, June 17, 2015, at the State House in Augusta. LePage said the budget is full of wasteful spending. Gov. 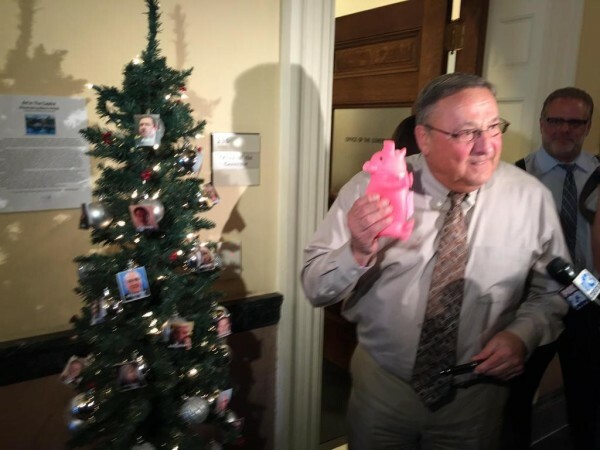 Paul LePage erected a Christmas tree with rubber pigs and biennial budget underneath it Wednesday at the State House in his latest condemnation of the biennial state budget passed Tuesday, June 16, 2015 by the Legislature. Gov. Paul LePage erected a Christmas tree outside his office on Wednesday, June 17, 2015, to protest the biennial state budget. Taped to Christmas ornaments were pictures of lawmakers, including Sen. Roger Katz, R-Augusta, and Sen. Justin Alfond, D-Portland, both of whom are Jewish. 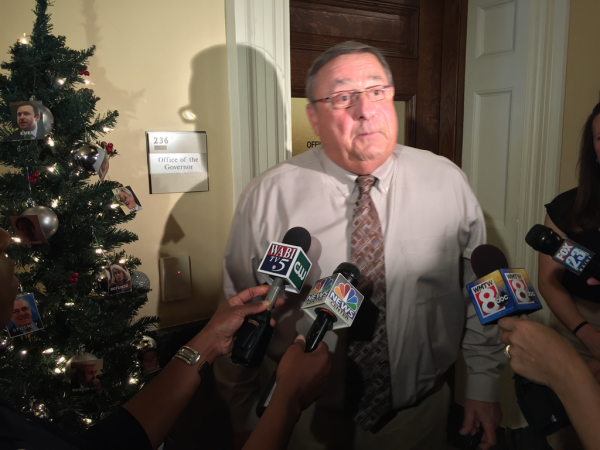 AUGUSTA, Maine — It was like a scene from a surrealistic dream: The governor steps out of his office to the Christmas tree arranged there. It’s mid-June. 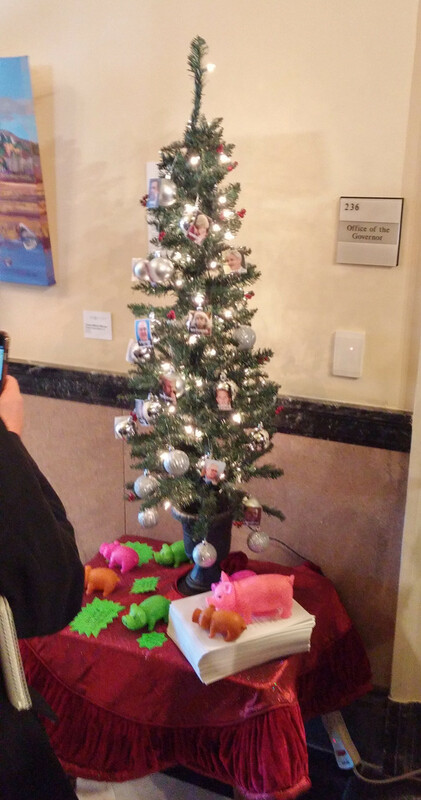 The governor takes a pink rubber pig from beneath the Christmas tree and squeezes it. “Oink, oink,” says the pig, though it sounds a little more like a duck. But it was not a dream. It was Republican Gov. Paul LePage’s latest overture against the Legislature, which he said passed a biennial state budget at 12:30 a.m. Wednesday that was filled with wasteful spending and misplaced priorities. The Christmas tree often is used in politics as a symbol of spending bills to which numerous projects are attached. Pigs, or pork, are equally as symbolic of wasteful spending. Among the programs LePage objected to were a feasibility study for train service to the Auburn area, refurbishment of the Wood Island Life Saving Station and a project at the Frances Perkins Homestead in Newcastle. House Majority Leader Jeff McCabe, D-Skowhegan, said LePage’s appearance Thursday would further isolate the governor politically. LePage reiterated a statement he made earlier this week that he would line-item veto multiple spending items in the budget bill, which may require potentially hundreds of roll-call votes in the House and Senate to overturn them. LePage acknowledged that because line-item vetoes require only simple majority votes to override — which means 50 percent of lawmakers plus one — that his vetoes likely would not hold. He said his intent was to make a point by jamming up the legislative process with line-item vetoes and his ongoing vetoes of every bill sponsored by Democrats. “I want to show that for five months they wasted our time and this time I’m going to waste a little of their time,” said LePage, who also said he sent “200 vetoes” to the Legislature on Wednesday afternoon. Wednesday was the Legislature’s statutory adjournment day, but lawmakers worked into the evening with more than a dozen bills to move through the legislative process. McCabe said the line-item vetoes likely would take two days to vote on and the vetoes of Democratic bills — all but two of which have been overridden so far — could keep the Legislature in session longer than necessary. 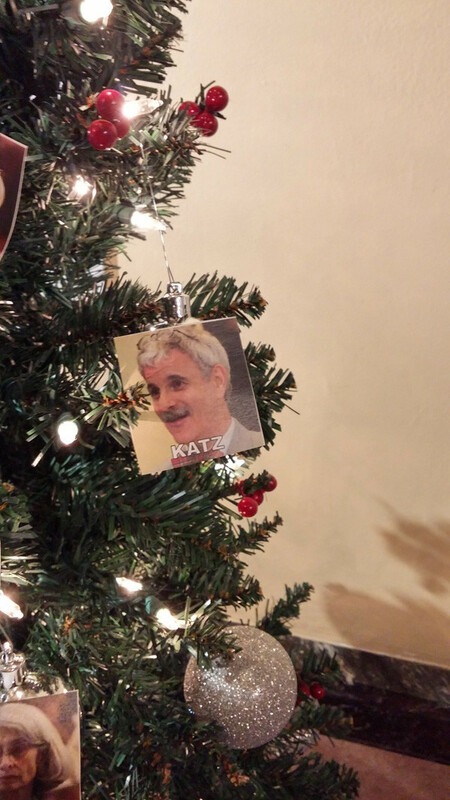 The Christmas tree included ornaments with lawmakers’ faces on them, including Sen. Roger Katz, R-Augusta, who is Jewish. Katz has been one of the more outspoken Republican critics of some of LePage’s past behavior, including verbal outbursts and withholding voter-approved bonds. He also served on the Appropriations Committee, where Senate Republicans joined Democrats to propose a budget compromise opposed by House Republicans and LePage because they said it did too little to reform Maine’s tax structure and welfare programs. Amid the political theater by LePage was the repeated statement of a long-held goal of eliminating what is known as the “cascade.” This is a financial mechanism that routes end-of-fiscal-year revenue surpluses to programs designated by the Legislature. LePage wants the surpluses flowing to the rainy day fund. LePage’s public appearance, which was crowded with reporters after his staff called a news conference for an “announcement,” came a little more than 12 hours after the Legislature passed a biennial budget bill that has been under negotiation for months. By 6 p.m. Wednesday, legislative leaders said they had not seen any of the “200 vetoes” LePage said he issued that day. A request for clarification to LePage’s office went unanswered.